John Allan not only introduced both modern and innovative methods and materials in his building design techniques, but also demonstrated interest and participated in the in arts and crafts revival movement in architecture taking place in late 19th Century Scotland and elsewhere. He also worked in partnership on some projects, with other Scottish architects such as John William Small, who specialised in artistic interior woodwork and furniture design. For a time John William Small had a specialist North British Art Furniture factory in Stirling, employing in 1886/7 around 30 skilled craftsmen. John William Small’s company carried out a considerable amount of interior restoration work at Falklands Palace for the 3rd Marquis of Bute. 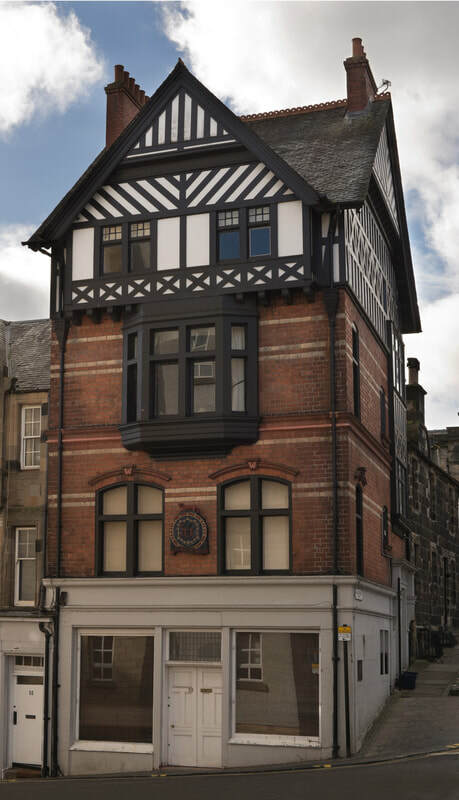 We consider John Allan’s 1897 design of the Wolfcraig building in Port Street (see cover image of booklet) to be one of his most significant accomplishments. It is an extraordinary inventive and highly decorative building. Five storeys high built with Welsh Ruabon brickwork, below a lead covered “Cup and Saucer dome.” The building also made extensive use of steel. See p24-25 of the booklet for more information. Also 55 Baker Street built slightly earlier in 1890, was John Allan’s first building in brick in Stirling. 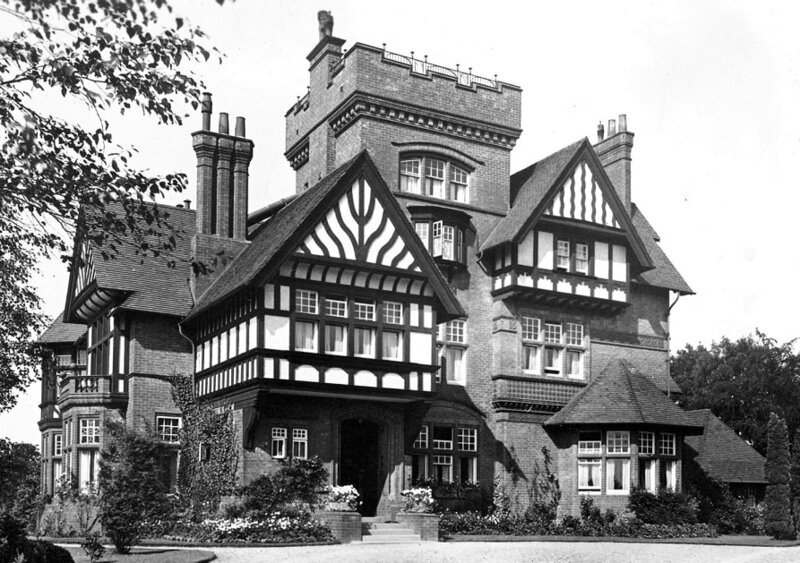 It is a “four storey two-bay, old English Tudor style corner construction with brick arched windows at first floor level, a broad bay corbel at the second floor” and a “ jettied top storey in black and white half –timbering”. It is a most unusual building and must have stood out significantly in the traditional streetscape of this part of Stirling in late 19th century. ( See picture, right). However “Batterflats” in Polmaise Road, the Elizabethan revival arts and crafts mansion house John Allan built in 1893 for Mr Patrick Drummond, of the Drummond family of seed merchants in Stirling, is one of my favourites. In my opinion this house is one of john Allan’s greatest design achievements. Despite considerable alteration and change in use over time this mansion house remains very striking building and still contains some very interesting and attractively conserved decorative features including stained glass windows, artistic wood panelling and decorative metal work door panels. Some similarity but greater development in style can be found in Batterflats interiors, when compared with John Allan’s earlier introduction of arts and crafts interior design features in his own home “ Cliffbank” in Albert Place, built around 1877. Here he experimented with curved walls, high skirtings, curved bay windows, decorative plaster work, wood panelling etc. There is also a beautiful stained glass domed cupula, located above the main stairwell in this house. Article researched by Stuart Campbell, Andy McEwan and Dorothy Wilson, all members of Stirling Local History Society. The article is based on a project carried out by the three researchers to produce a booklet on the architect's life and work which has now been published. To find out more about the project work involved, read this article. There are several references to the booklet throughout the article and the opinions expressed are those of the three people involved. There is an exhibition of John Allan in the Smith Museum. ​Stirling Council Archives have a great deal of information on John Allan as well. 55 Baker Street. courtesy Jo Cound and SCHT.